ONEWORLD (AUS) (Bay or Brown 2004-Stud 2012). 8 wins-1 at 2-to 1400m, HK$13,129,350, 736,000Dhs, HKJC Jockey Club Sprint, Gr.2, 2d Hong Kong Sprint, Gr.1, HKJC Premier Cup, HK-3, Sha Tin Sprint Trophy, HK-3, Premier Bowl H., HK-3, 3d Meydan Dubai Golden Shaheen S., Gr.1, HKJC Centenary Sprint Cup, HK-1. Half-brother to SW First Command (MRC Caulfield Sprint H., Gr.2). Sire of Eurack, Boots an All, etc. Stannis Baratheon (g. by Amadeus Wolf). Winner at 1200m in Aust. Queen Kate (f. by Kempinsky). Placed at 3 in Aust. Queen Camilla. Winner. See above. Mabrouk. 5 wins from 1200m to 1800m in Aust. Roman Estate (Bellotto). 5 wins from 1200m to 1900m, 3d VRC Sutcliffe S., L, WATC Race Calling H.
Belle Verde. 2 wins at 1350m, 2d BRC Bollinger Champagne H.
Rass Brightia (Bellotto). 3 wins from 1200m to 1600m, A$123,070, SAJC Razzle Dazzle H., Rocketville H., Blevic H., 2d SAJC Port Adelaide Guineas, L, 3d South Australian Oaks, Gr.1, SAJC Adelaide Guineas, Gr.3, HC Nitschke S., L, 4th VATC Sandown Guineas, Gr.2, VRC Great Western H., L. Producer. PIN SEC (Lonhro). 2 wins at 2, A$219,850, in 2018-19, Canberra RC Black Opal S., Gr.3, ATC Theraces 2YO H.
Bold Saxon. 3 wins at 1200m, 1400m in Aust. and HK, SAJC International H., Clipsal Safety H., 2d SAJC Keno H.
SETO STAYER (Bellotto). 8 wins from 1200m to 2000m, A$127,860, STC Neville Sellwood S., L, AJC Verdi Spumante Welter H., Billy Cook Flying Welter H., STC Helios H., 2d STC Lord Mayor's Cup, L, Mastercut Meats H., 3d AJC Monte Carlo H., 4th Hanshin Naruo Kinen, L.
Shelved (Bellotto). 2 wins at 1300m, 1900m, A$194,320, STC Punchbowl H., Timms Roofing H., 2d Victoria Derby, Gr.1, 3d STC Cammeray Bowling Club H., 4th STC Rosehill Guineas, Gr.1. Hot Shoes (Sir Tristram). Winner at 2, VRC Robertson H., 2d VATC Mercedes-Benz H., L, 3d SAJC Pago Pago H. Producer. Kosapac. 8 wins-1 at 2-to 1350m, AJC Goose Boy H., 2d AJC Henry Kendall H., Staff H., STC Gunnamatta Probus Club H., Smiffee's 40th Birthday H., Hahn Premium Light H., 3d STC Derby Club H.
Receptor. 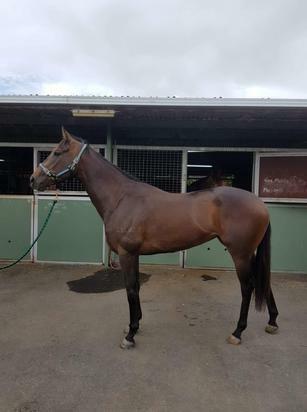 5 wins from 1350m to 2250m, A$100,780, SAJC Torn Irrigation H., Castle Tavern H., Satab.com.au H., Esplanade H., Plympton H., 2d SAJC Turf Monthly H., Kaye Sutherland Memorial H., 4th SAJC OJ Smith Challenge S., L, Geelong RC Derby Trial S., L.
Honolulu. 3 wins-1 at 2-from 1400m to 2200m, Qld Tatt's RC Foster's Light H., QTC Maisons-Lafitte H., VATC Cardinia H., 2d VRC Rainbird H., BATC Mitre 10 H., 3d VRC Kittyhawk H., BATC Sensational Skins Series H. Producer. Race Record: 3 Starts 0-0-0 A$3,850.